As the longest-reigning British monarch, many people today find it hard to remember a time when Elizabeth II wasn’t the Queen of the United Kingdom. Elizabeth has been in power for more than 60 years but for the first decade of her life, no one ever considered she’d even be in line for the throne. Before she became one of the most powerful women in the world, she was a quiet home-schooled girl, a truck mechanic, and a budding corgi lover. 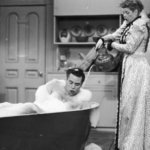 Check out these rare vintage photos of Elizabeth accompanied with some incredible facts about her early life that show a completely different side of her. When Elizabeth was born to the Duke and Duchess of York, she stood third in line to the crown. It was her uncle, Edward, who was in line to be king but he famously abdicated the throne after only eight days. 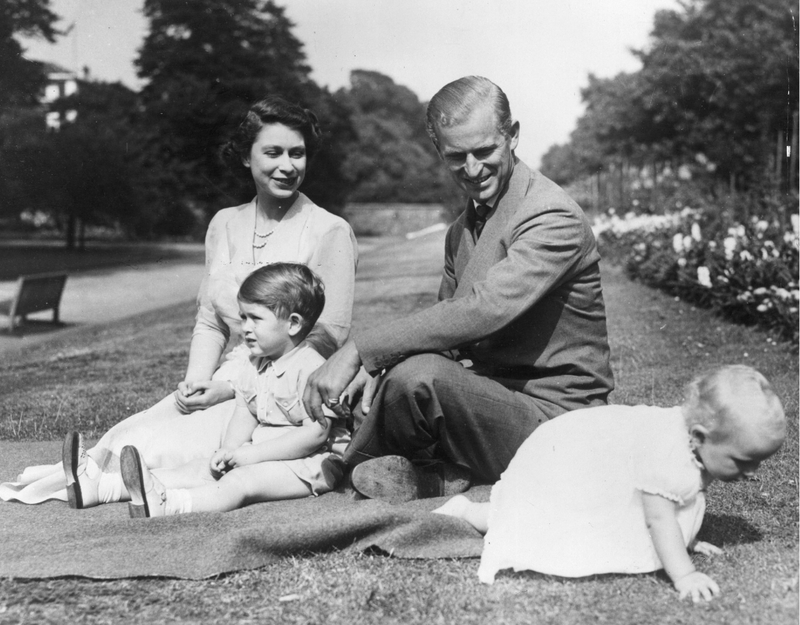 That left Elizabeth’s father, now King George VI, as the ruler of the British Empire. Elizabeth had spent the first ten years of her life never expecting to one day be queen. When all of that changed in 1936, she had some serious catching up to do. 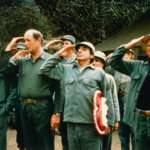 Elizabeth doesn’t just love watching movies and plays – she has also always loved acting in them. 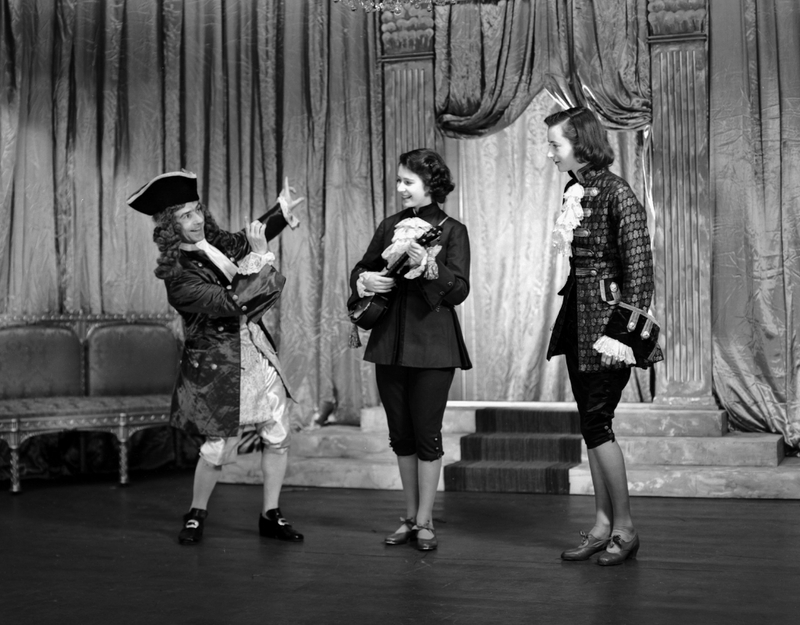 Here, a teenage Princess Elizabeth (middle) is dressed up as the character of Prince Charming for a royal pantomime in 1941. 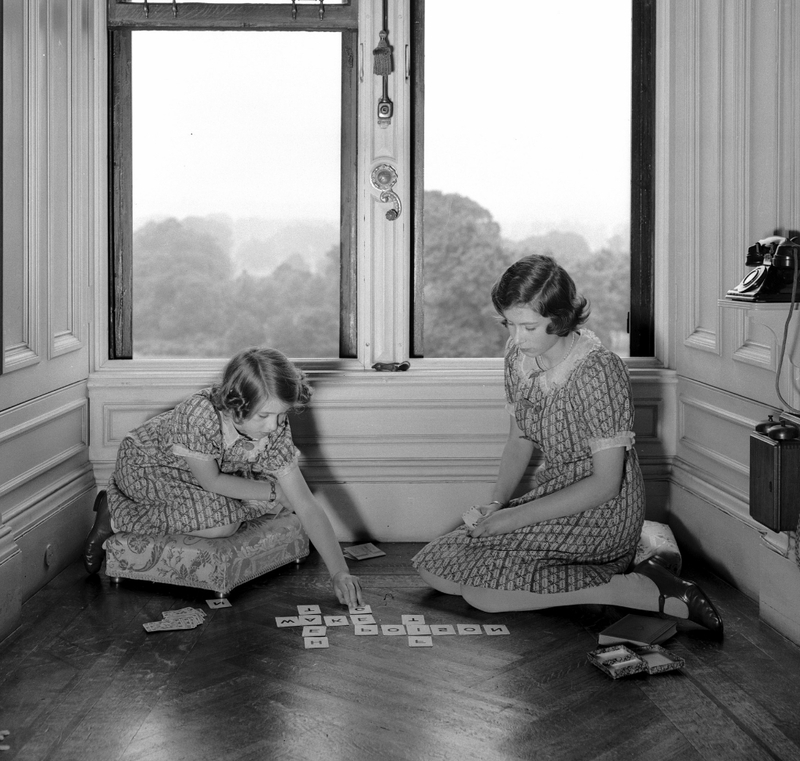 It was actually Elizabeth’s younger sister Margaret who proposed the idea of having the girls put on the plays every holiday during wartime to help boost morale. Elizabeth acted in three of the holiday pantomimes and exclusively played male characters. 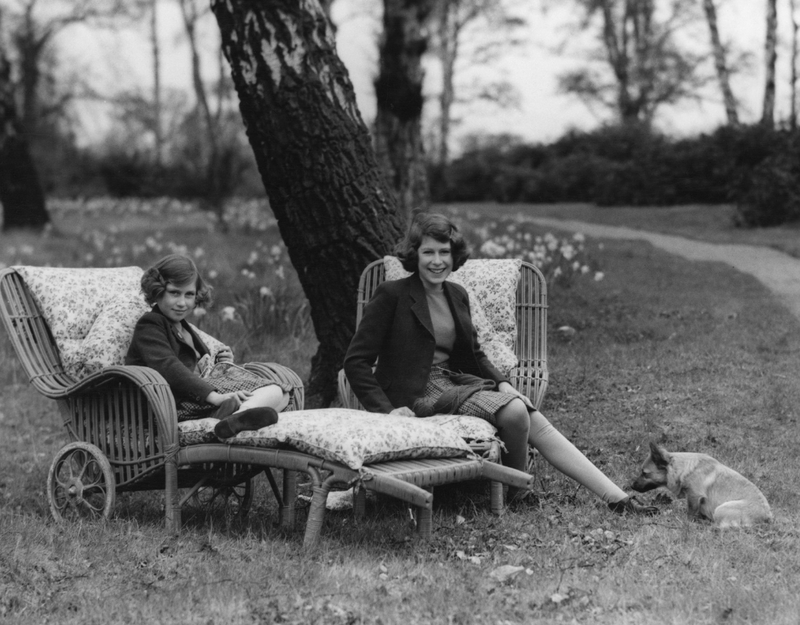 This photo of Elizabeth and her younger sister Margaret was taken in 1933 when Elizabeth was only seven years old. 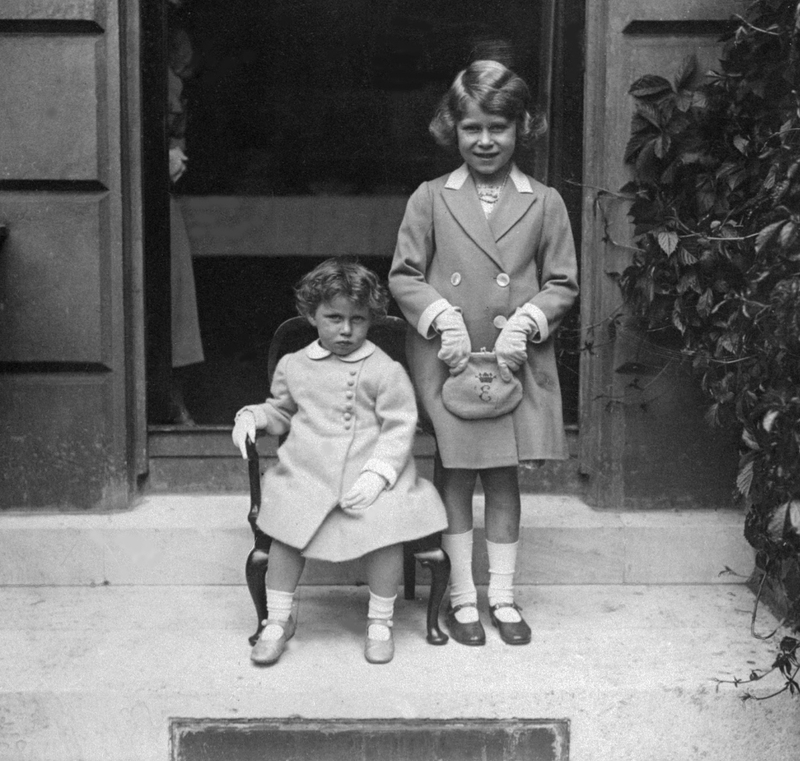 The two girls were the only children of King George VI and incredibly close all their life. In fact, it was Margaret that came up with Elizabeth’s family nickname. Margaret couldn’t pronounce her older sister’s name and would resort to calling her “Lilibet.” Over time the name stuck, and everyone began calling her Lilibet. Coming up, find out how the young princess was educated. 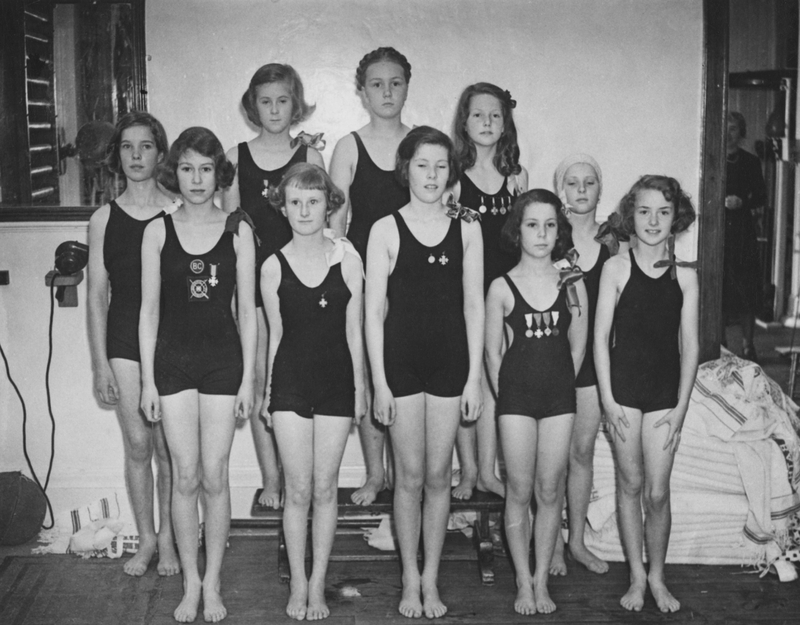 Elizabeth (front left) is seen here with her Challenge Cup swimming team. Swimming was one of Elizabeth’s first hobbies and passions. She was enrolled in lessons when she was 10 years old and one her first medal the same year. A royal’s participation in a sport of “less prestige” inspired many other children in the British Empire to pick up swimming. Her love of swimming stayed with Elizabeth and when she was coronated, she bestowed her patronage to the British Swimming club. Thanks to Princess Diana’s choice to enroll Prince William and Prince Harry in school, we’re used to seeing the royal children attending schools but that wasn’t always the case. 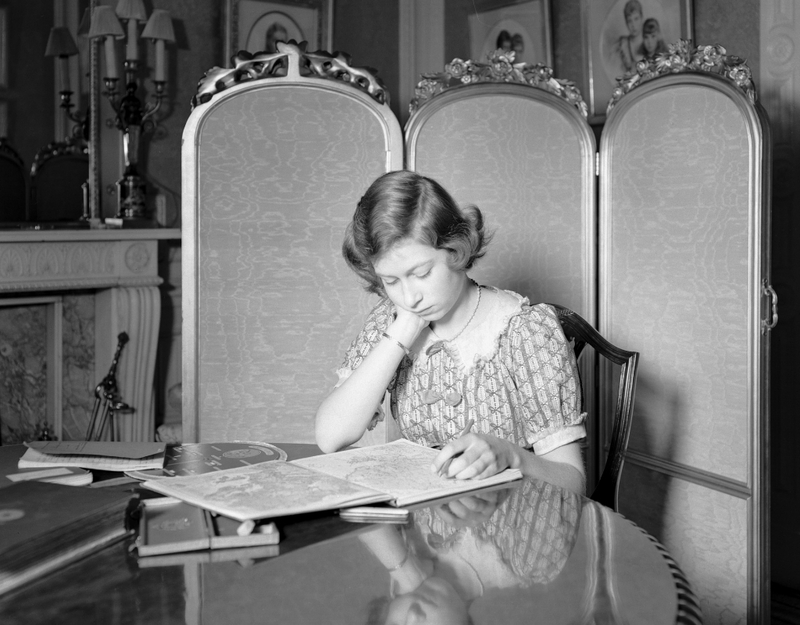 Most royal children were homeschooled and Elizabeth was no different. Both she and her sister Margaret were tutored in their home. Of course, they didn’t employ just any tutor. One of Elizabeth’s teachers was Henry Marten, who was the vice-provost of the famed Eton College. She also received private religion lessons from none other than the Archbishop of Canterbury. Next, find out how Elizabeth came to completely cut out the woman who raised her. 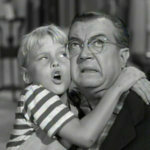 Elizabeth and her sister were raised primarily by their nanny, Marion Crawford. 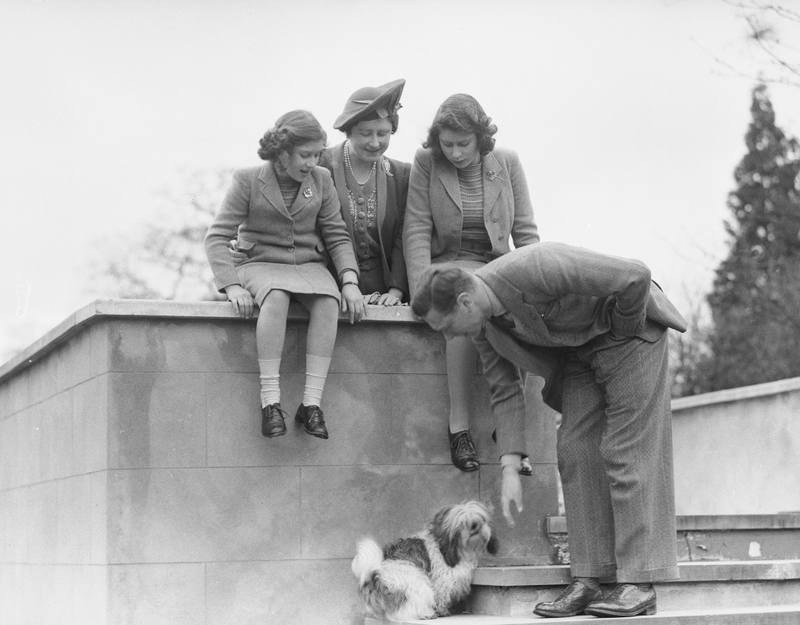 Crawford watched over the girls from birth and only retired when Elizabeth finally married Prince Phillip in 1947. Crawford was responsible for teaching much of Elizabeth’s etiquette and even some schooling. Crawford’s legacy took a dark turn though after her retirement when she wrote a tell-all book titled The Little Princesses. She was the first nanny to cash in on the royal’s private life and as a result, Elizabeth and the Royal Family never talked to Crawford again. 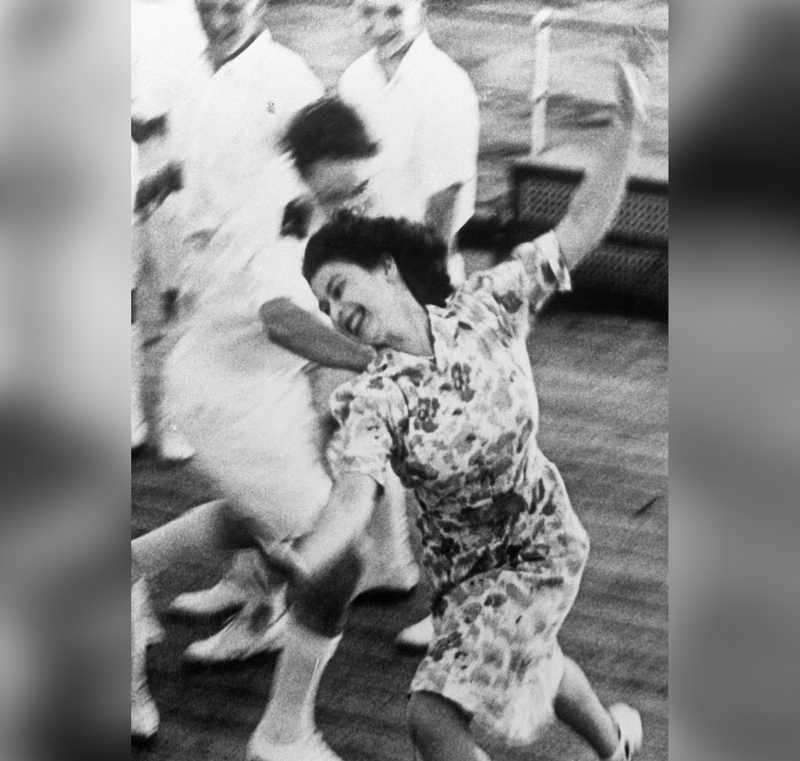 Before she was queen, Elizabeth had some rare moments where she let loose. Here, she plays tag on top of the HMS Vanguard. Another special moment for her was when WW2 ended on May 8, 1945. She and her sister begged their father to let them celebrate on the streets with the people, and he actually allowed it! 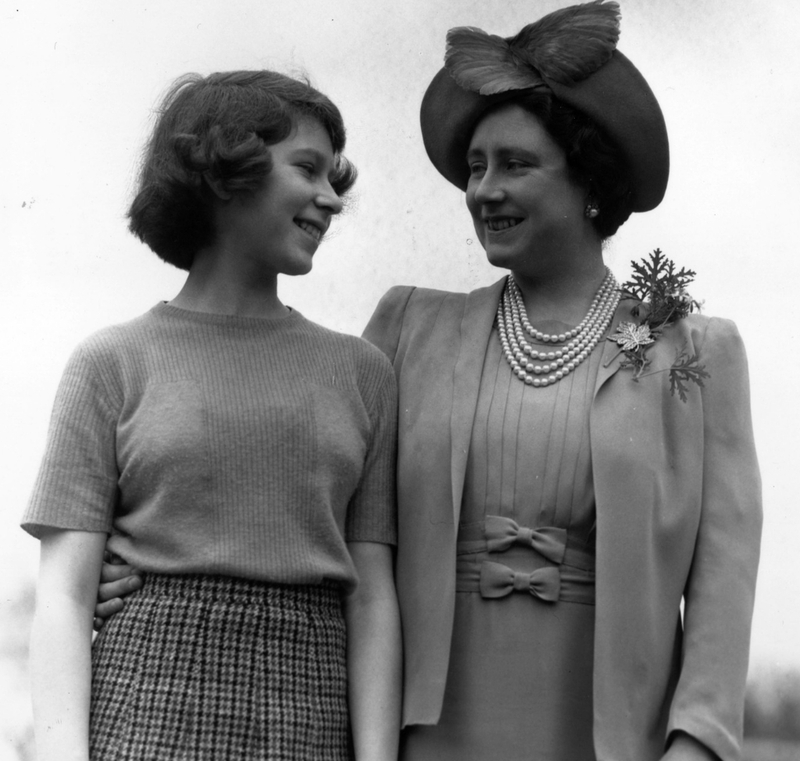 Here, a 15-year-old Elizabeth stands with her mother, also named Elizabeth. 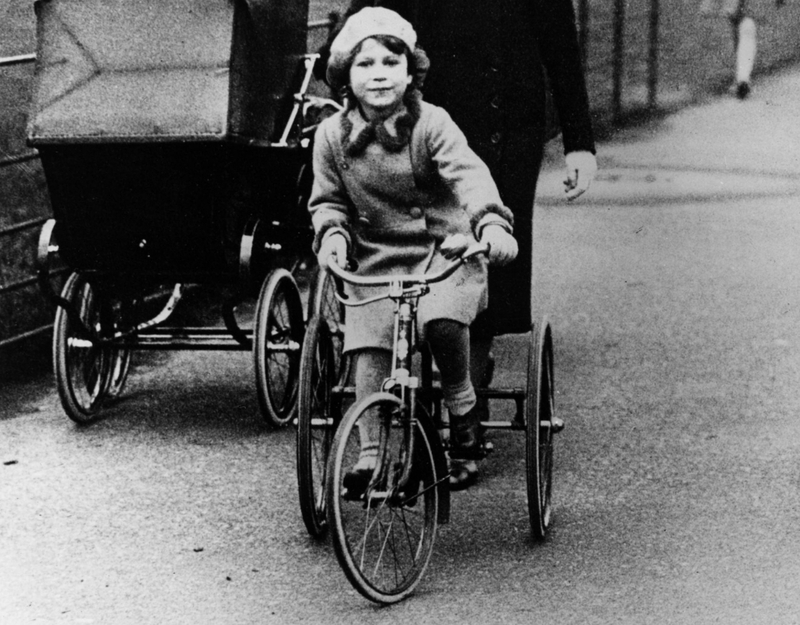 The Queen Mother gave birth to Elizabeth on April 26, 1926, but only celebrating on that day wasn’t enough. Once she became queen, the royal family deemed April 26 to be too cold for a proper public celebration. Now, she celebrates her April 26th birthday and another public celebration on a Saturday in May or June, when it’s warmer. The second birthday usually coincides with the Trooping the Color military parade. Coming up, find out how Elizabeth managed to help out in WW2 when she was only 14. Despite being in the spotlight since birth, Elizabeth has always been camera shy. Even in this photo from when she was 10, you can see Elizabeth is slightly uncomfortable around the camera. The shyness didn’t go away as she grew older and she actually didn’t even allow pictures to be taken at her wedding. Elizabeth also didn’t want her coronation to be televised. When she finally caved and allowed a camera inside Westminster Abbey, the one condition was that there be no close-ups of her face. 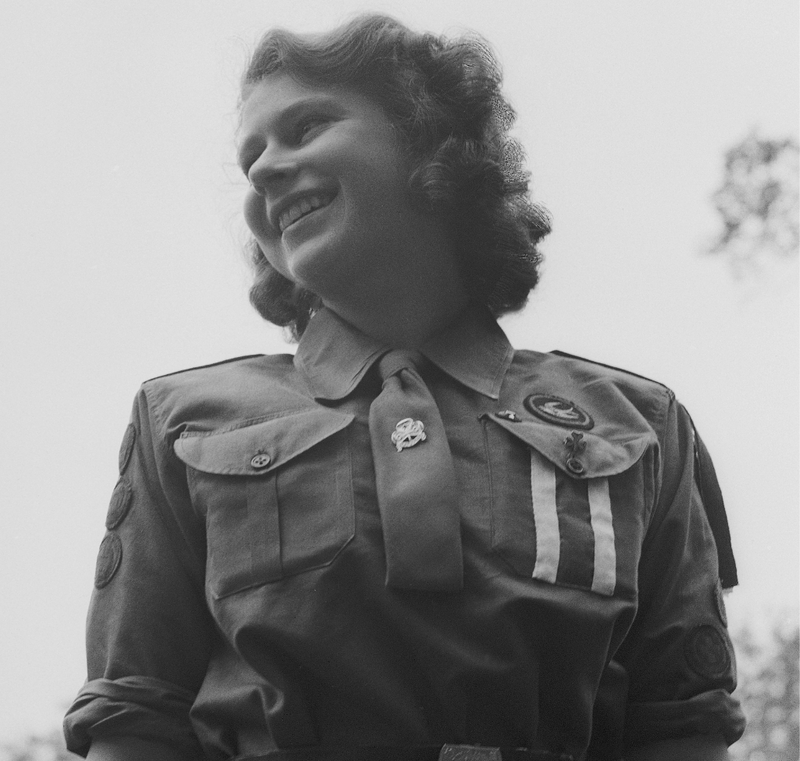 Elizabeth might look happy in this 1942 photo of her in her girl guide uniform but beneath it, she desperately wanted to be on the frontlines of the war. 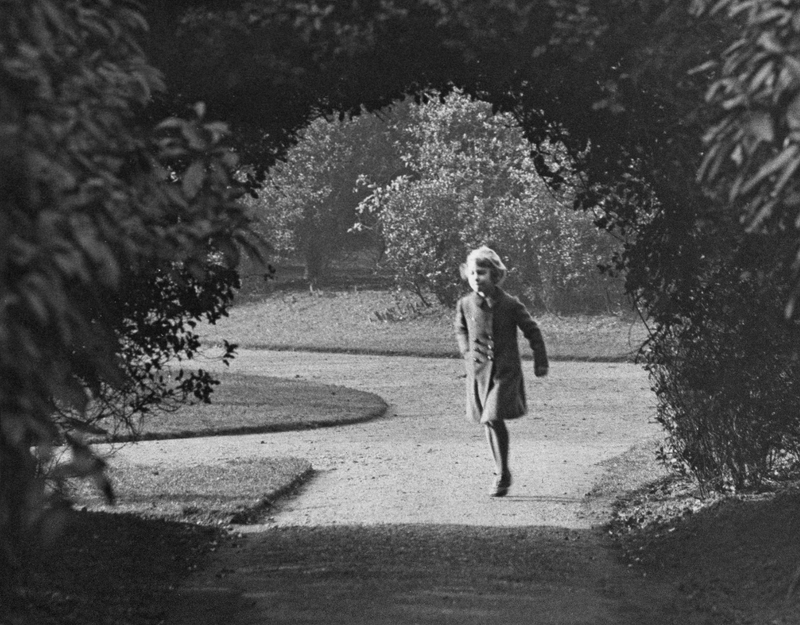 Elizabeth was only 14 when the war broke out and she actually begged her father to let her joint he war effort. Since he refused to allow her to join she took it upon herself to begin public service in the girl guides. Elizabeth also started a radio broadcast to try and boost the public’s morale. Elizabeth was finally old enough to join the war effort in February 1945, just as World War II was ending. 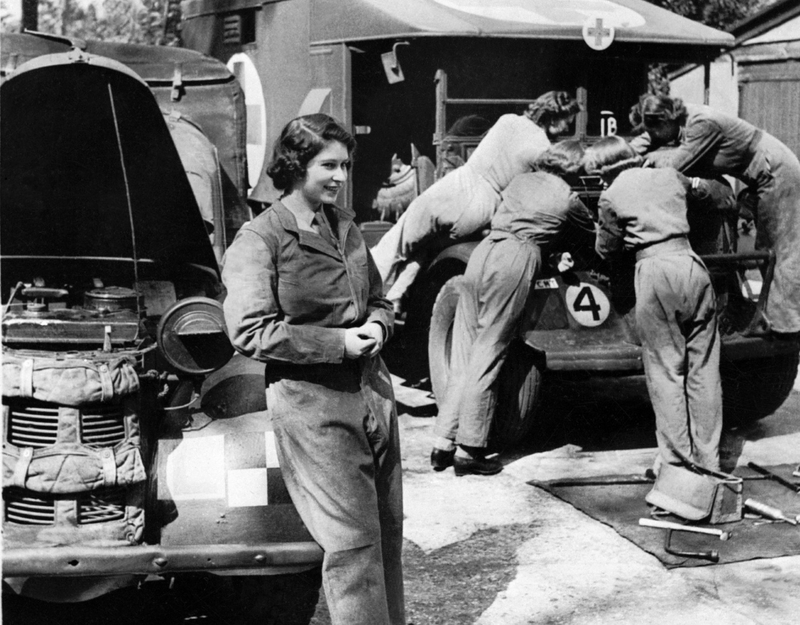 She was appointed to the Auxiliary Territorial Service and worked as a truck mechanic. 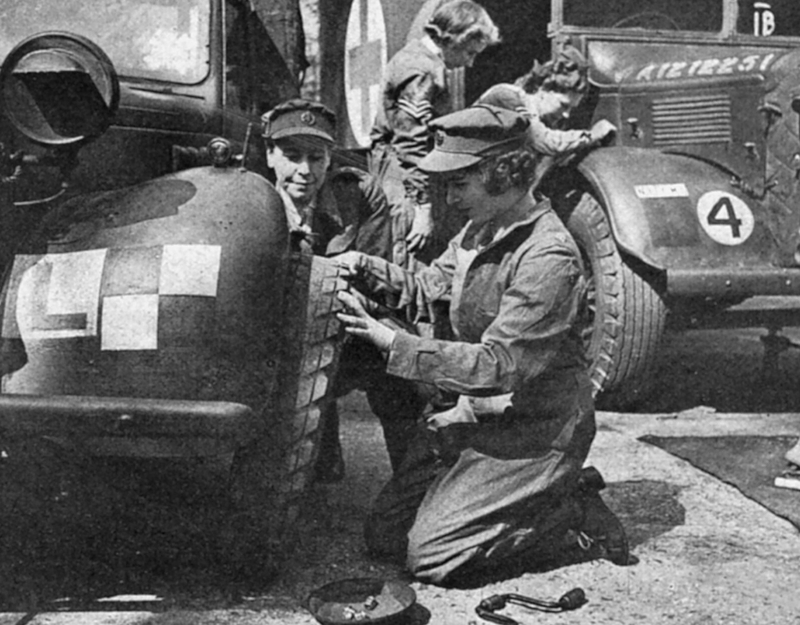 Here, she’s learning how to change a car wheel on an armored military vehicle. 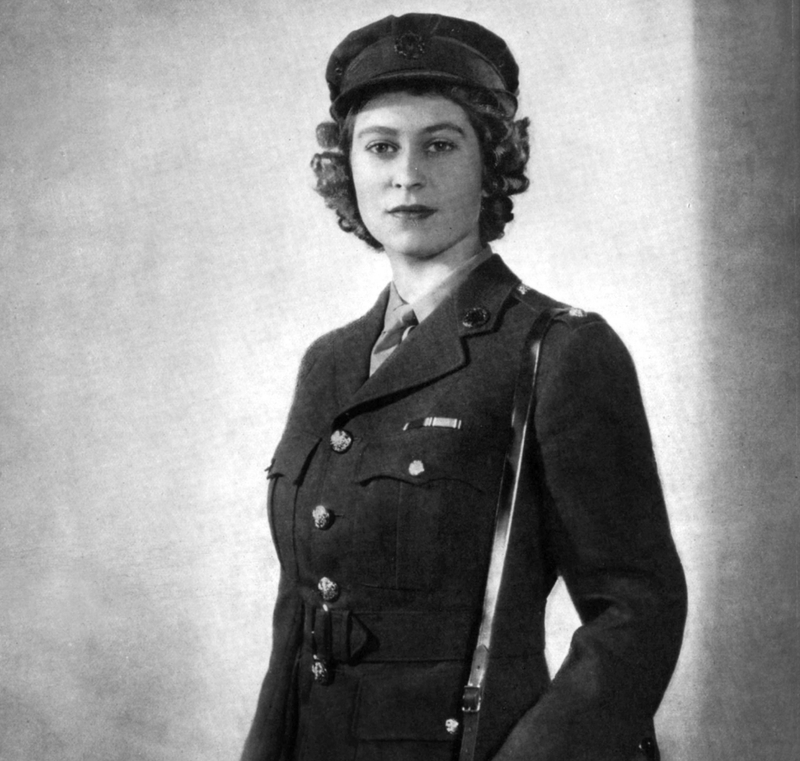 To this day, Elizabeth is the only female member of the royal family to have served in the armed forces. You’ll never guess how she formed her love of corgis. 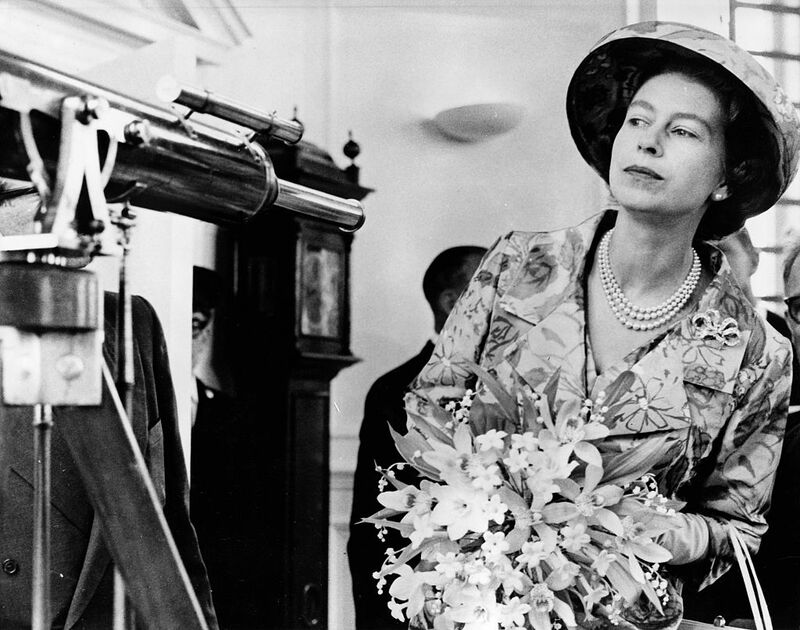 Elizabeth officially became Queen on February 6, 1952, after her father died. She had actually been acting on behalf of him before that though. King George VI’s health had been in decline since early 1951. Elizabeth stood in for him at many public events and even went on royal tours. 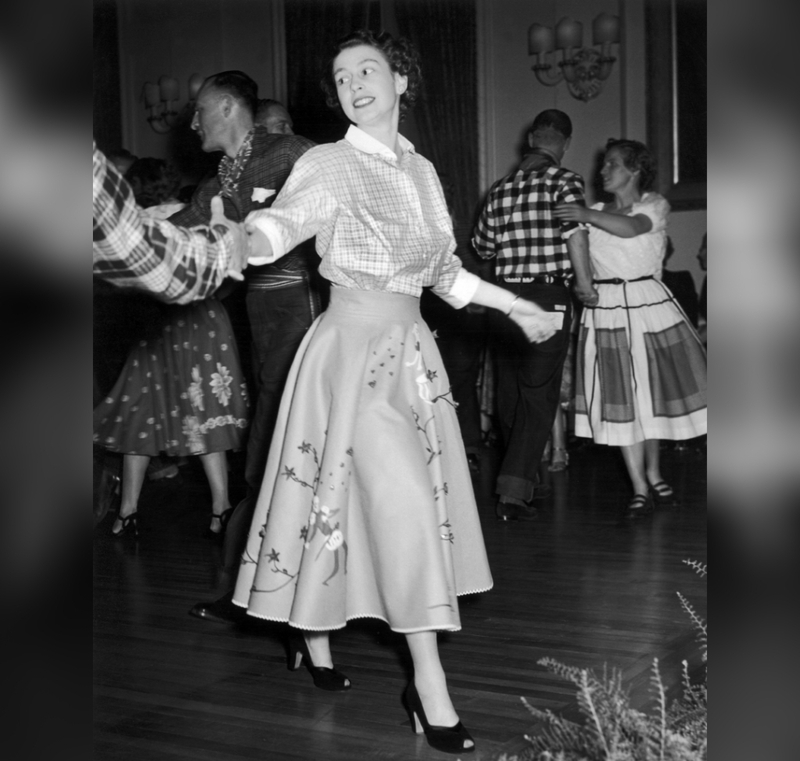 Here, Elizabeth is seen dancing while on a tour of Canada in place of her father in 1951. While she was in Canada, her secretary actually carried a draft declaration of accession in case the King died while she was away. 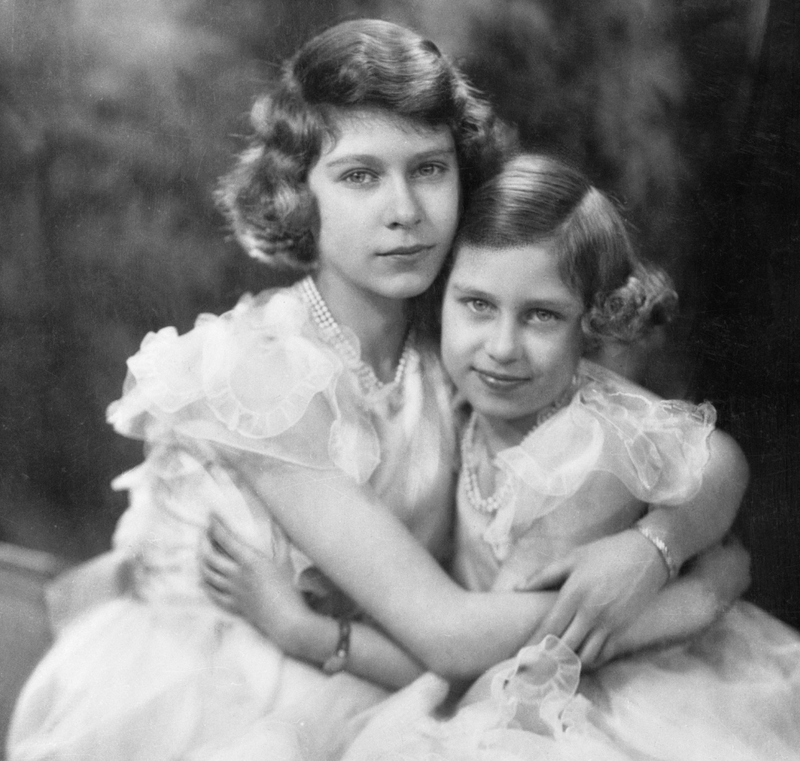 Elizabeth and her youngest sister Margaret look practically angelic in this portrait from 1940 but in their former nanny’s tell-all book they still had some sisterly quarrels. According to Marion Crawford, neither Elizabeth or Margaret “was above taking a whack” at each other if they other deserved it. 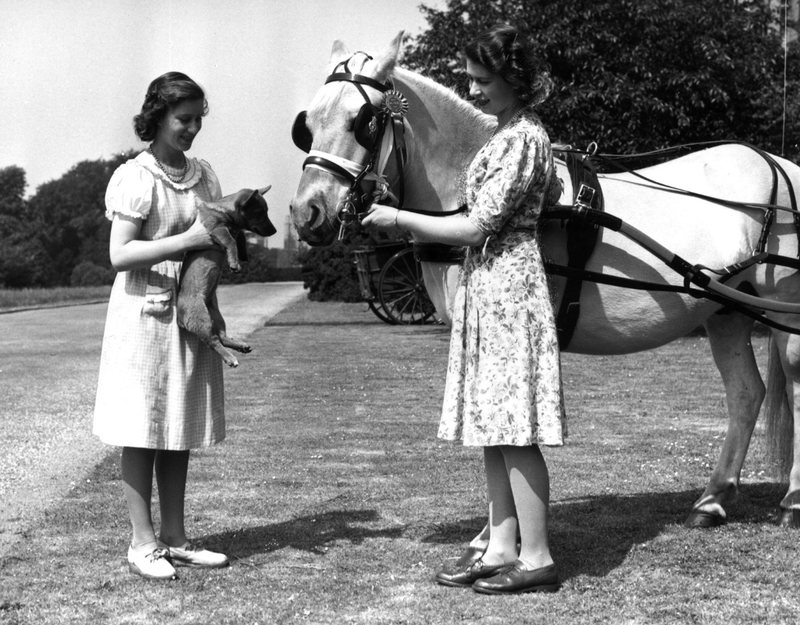 In this photo, Princess Margaret is seen holding up one of their corgis in front of a horse that Elizabeth is holding the reigns of. Since she was a young girl, Elizabeth has had a keen interest in both of these animals. 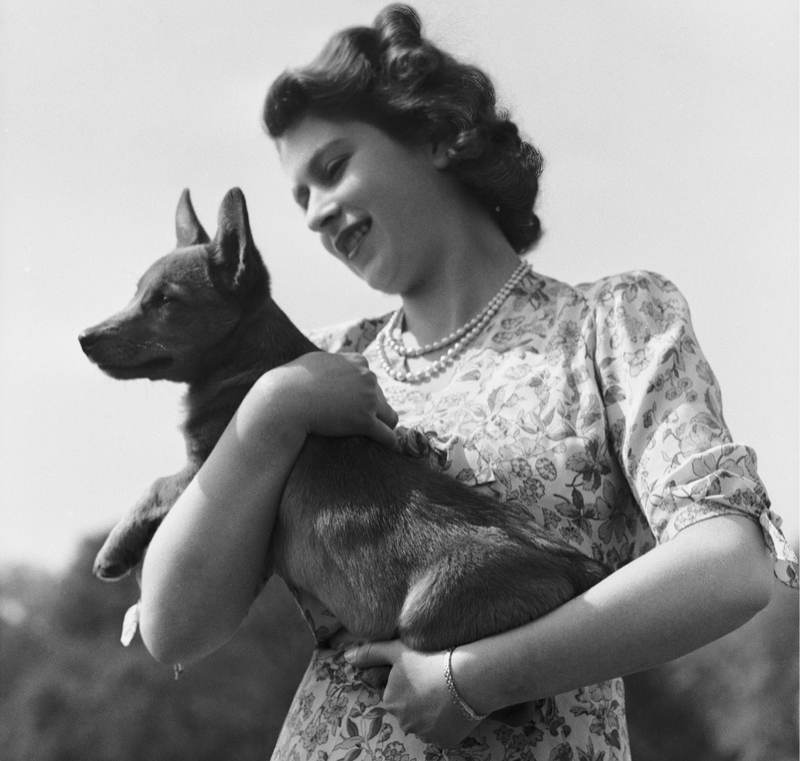 Today, the Queen has owned at least 30 corgis, all of whom descended from one of the family’s corgis named Susan. Elizabeth received her first horse when she was four and by 18 years old, was an accomplished rider. Keep reading to learn more interesting facts about the Queen’s corgis and horses. Elizabeth is now famous for her love of Corgis and as you can see here, she’s always owned the dogs. She got her first corgi, Dookie, in 1933 when she was only 7 years old. Her corgi breed of choice is the Pembroke Welsh Corgi. 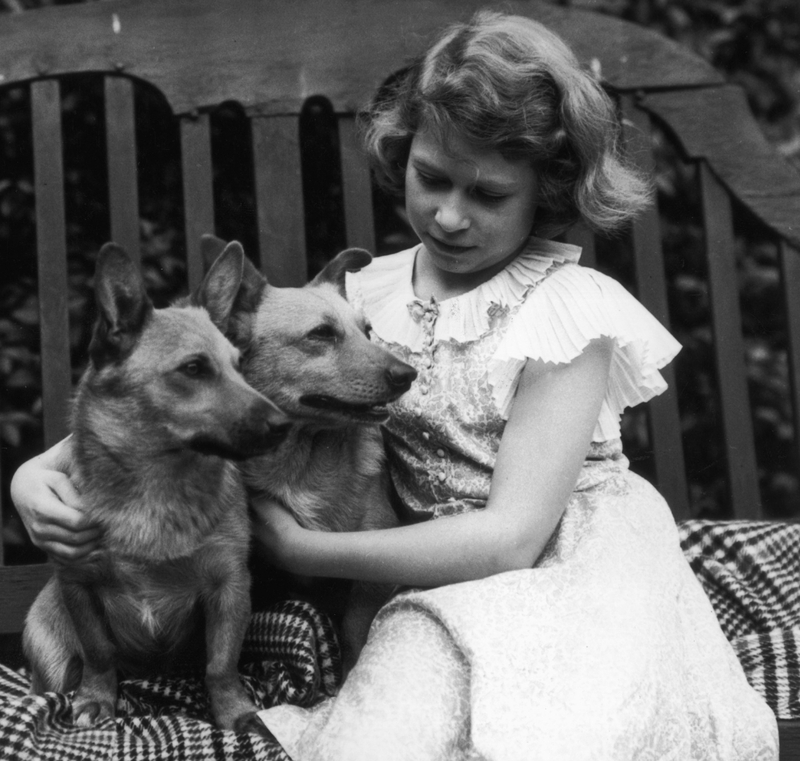 Since becoming Queen in 1952, she has owned over 30 corgis. She has always taken part breeding her corgis and even created the Dorgi—a cross between her dog and her sister Margaret’s Dachshund. 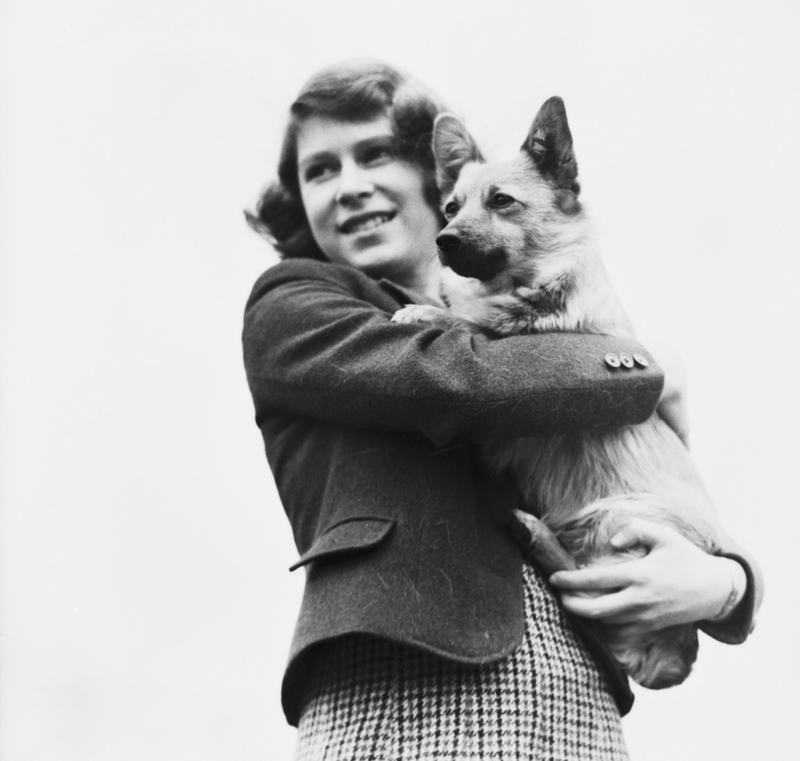 In 2012, Elizabeth announced she stopped breeding her dogs so as not to leave any behind when she dies. 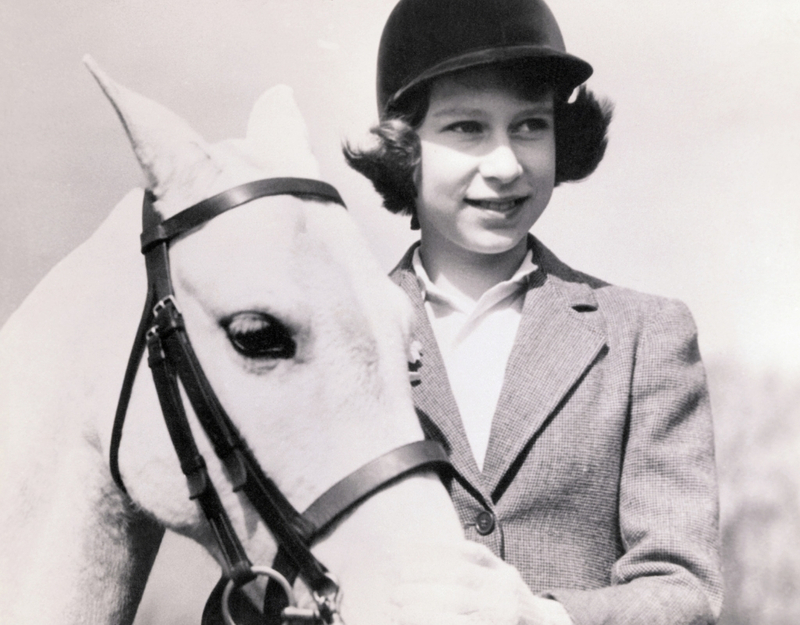 Like many members of the royal family, Elizabeth was brought up to ride and love horses. She was given her first horse, a Shetland pony named Peggy, when she was 4 years old. Here, she’s pictured with a pony on her thirteenth birthday. 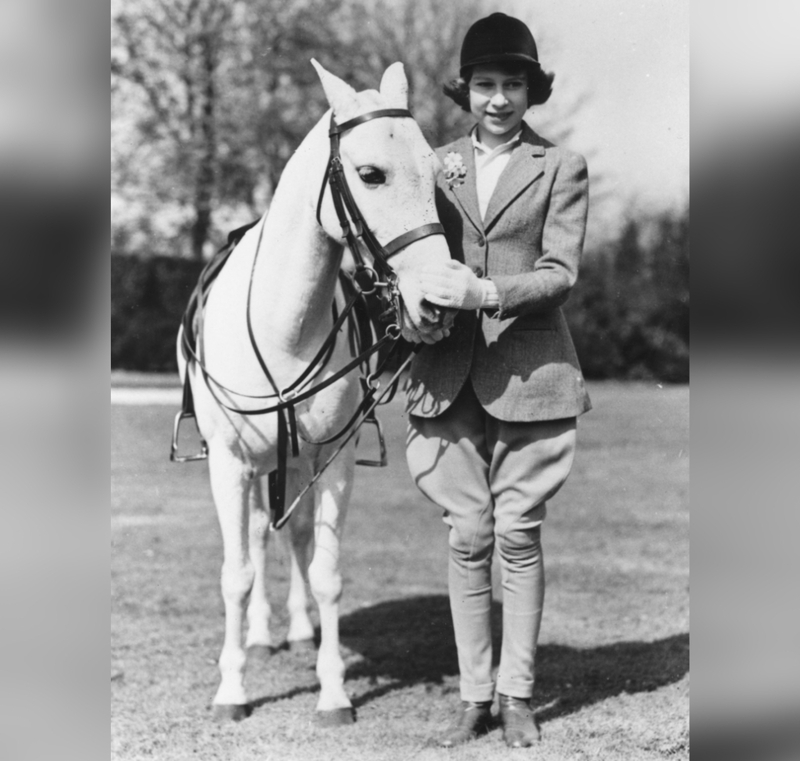 By the age of 18 Elizabeth was an accomplished equestrian and throughout her reign she would use horse riding as a way to relax. Elizabeth even attended many royal events on horseback until 1986, when she switched to a carriage. 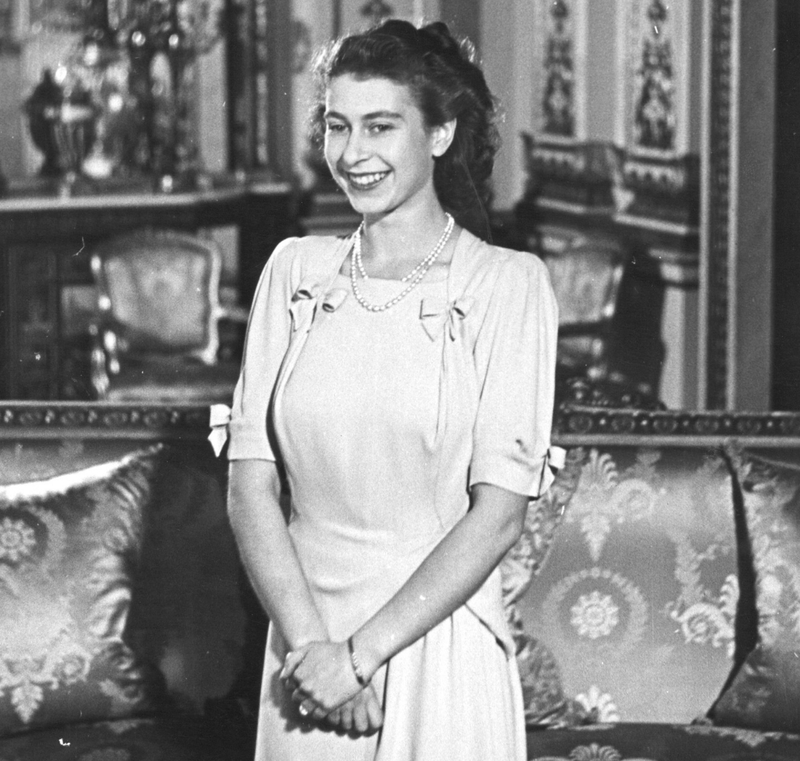 This photo of Elizabeth was taken in 1947 at the official announcement of her engagement to Phillip Mountbatten. The two met when Elizabeth was only 13 and they would exchange letters. 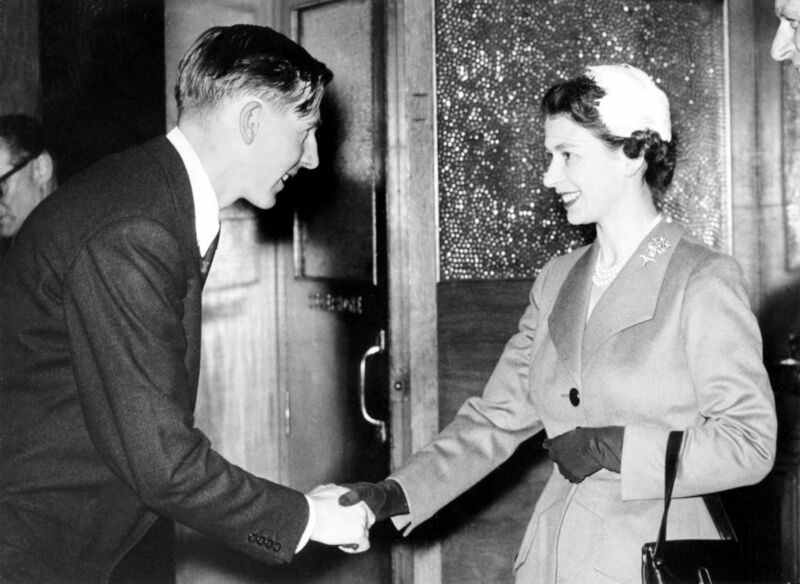 Phillip proposed in 1946 when they were vacationing together in Scotland and Elizabeth accepted. She was only 20 at the time and didn’t want to tell her father yet. Eventually, King George VI got wind of the engagement and accepted it but made her wait until her 21st birthday to publically announce it. To help become more accepted, Phillip renounced all his titles, converted to Anglicanism, and adopted the last named Mountbatten, from his British relatives. Technically, the royal family doesn’t have a last name and are only known by their first names. They do however get to choose a formal last name for certain events. Before her marriage, Elizabeth’s surname was Windsor, a name that George V chose in 1917. After her marriage to Phillip, Elizabeth was initially going to keep Windsor but Phillip felt that disrespected him. In 1960, she officially became Elizabeth Windsor-Mountbatten as a nod to her husband. Elizabeth was still an active member of the military when she was married in 1948. 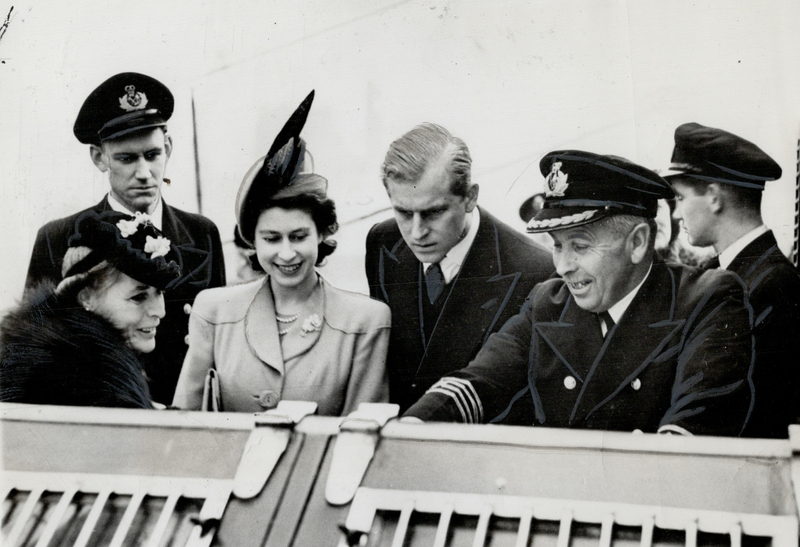 This photo, taken earlier that same year, shows Elizabeth’s devotion to the continued effects of WW2. She could see others still reeling from the war so she decided to use only ration coupons to make her wedding dress. The ivory Duchesse silk dress with a 13-foot train took six months to make and hundreds of coupons. 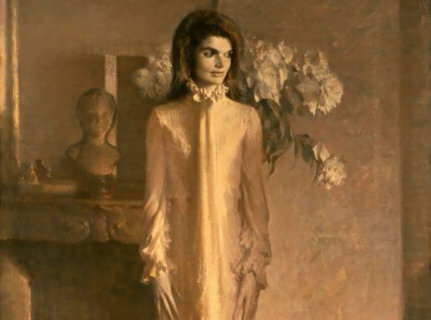 Elizabeth used saved rations and a 200-coupon supplement from the government to pay for the dress. 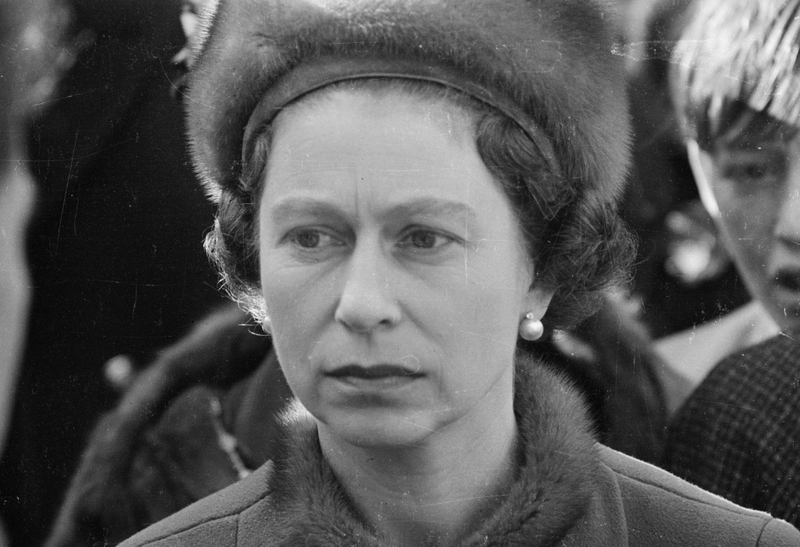 On April 29, 1970, there was a purported assassination attempt of Queen Elizabeth. Now known as the Lithgow Plot, the would-be assassins targeted the Queen while she was on a train trip from Sydney to Orange with her husband. The men supposedly rolled a large wooden log onto the train track when it was dark in an attempt to derail the train, causing it to smash into an embankment. Fortunately, their plot failed because the train was moving slowly when it hit the log. Through her at-home tutoring, Elizabeth’s interests were sparked by history and law. Once her father ascended the throne when she was 10 years old, it became clear to Elizabeth that she now had to train to be a monarch. Due to that, she focused on the subject she felt would make her a better queen. Elizabeth has always enjoyed a few small perks that many people would beg for. Since both driver’s licenses, plates, and passports are issued in the Queen’s name, she herself doesn’t need to have one. That doesn’t mean she’s been driving without any practice or lessons. 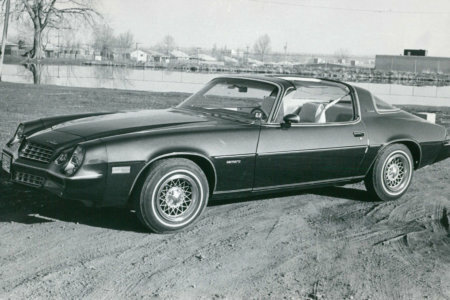 Elizabeth learned to drive while working as a truck mechanic during the war, and driving is actually one of her favorite hobbies. 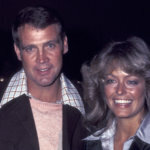 She often took joyrides in her Range Rover or Jaguar. 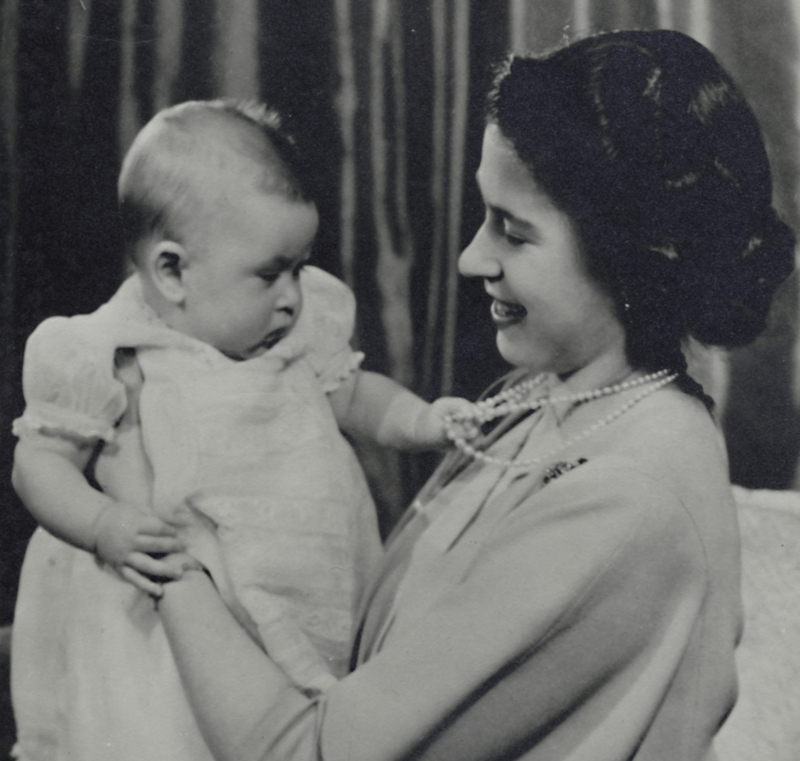 This photo from 1948 of Elizabeth with her first born child, Charles, reignited the controversy surrounding Phillip’s heritage. 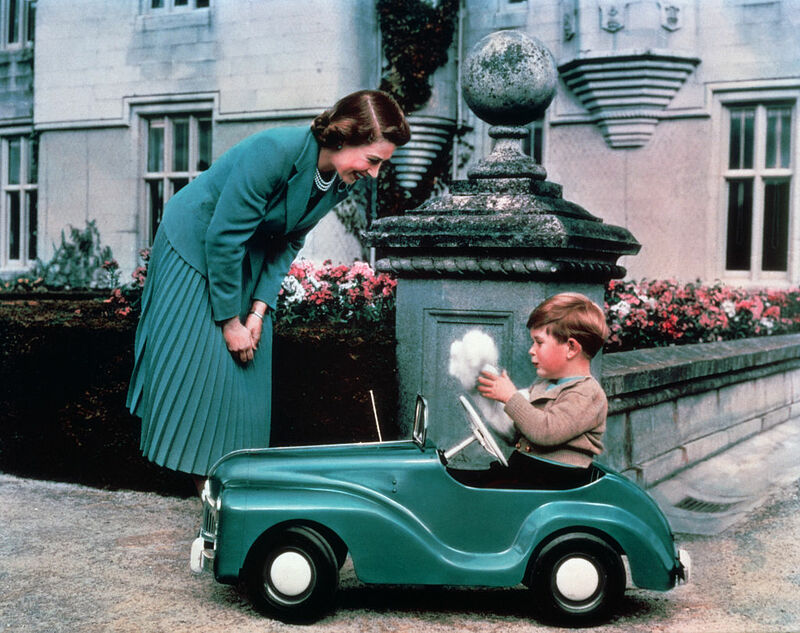 In 1948, no child was allowed to use the title royal prince or princess until both of their parents were royalty. One month before Charles’ birth, King George VI had to issue a decree allowing Charles to be a Prince, because technically Phillip had renounced his title to marry Elizabeth. Now, it’s common practice with the youngest royals like Prince George. From a young age, Elizabeth has had a respectable and healthy love of fine alcoholic drinks. On her wedding day, Elizabeth and Phillip drank gin and Dubonnet, which Elizabeth still enjoys to this day. She loved the drink so much that she has one every day at lunch and her favorite gin, Gordon’s Gin, even has a royal warrant to supply the family. Elizabeth’s only other drink of choice is champagne. During the 1981 Trooping the Color—which was also her birthday celebration that year—a 17-year-old named Marcus Sarjeant shot a series fo blanks at Elizabeth while she led the procession on horseback. Sarjeant was obsessed with assassinations but luckily, he wasn’t able to purchase live ammunition in the U.K. thanks to their gun laws. Elizabeth was shaken up but finished the procession like a true queen who had seen war before. 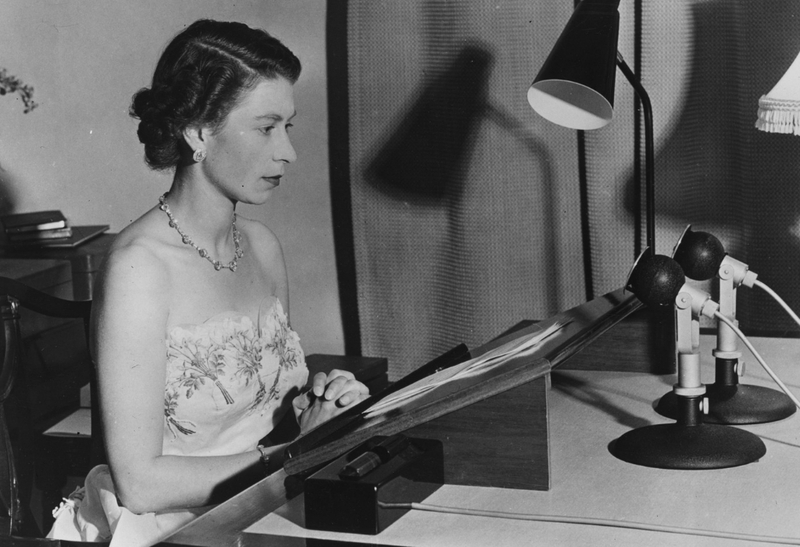 Since her birth in 1926 and the start of her reign in 1952, Elizabeth has watched over some serious technological changes. As a teenager, the most advanced form of tech for Elizabeth was the radio. In 2009, she joined Twitter and in 2010, she joined Facebook. Her accounts, like many social media accounts for heads of state, isn’t actually run by her. It’s mostly just the teams at Buckingham Palace giving us updates about her day to day activities. Elizabeth is seen here with her sister, mother, and father in 1940. After the family became the rulers of the British throne, they grew even closer to one another than before. Elizabeth was so close with her family that she was said to have cried frequently as a young girl when her father and mother would leave on royal tours. 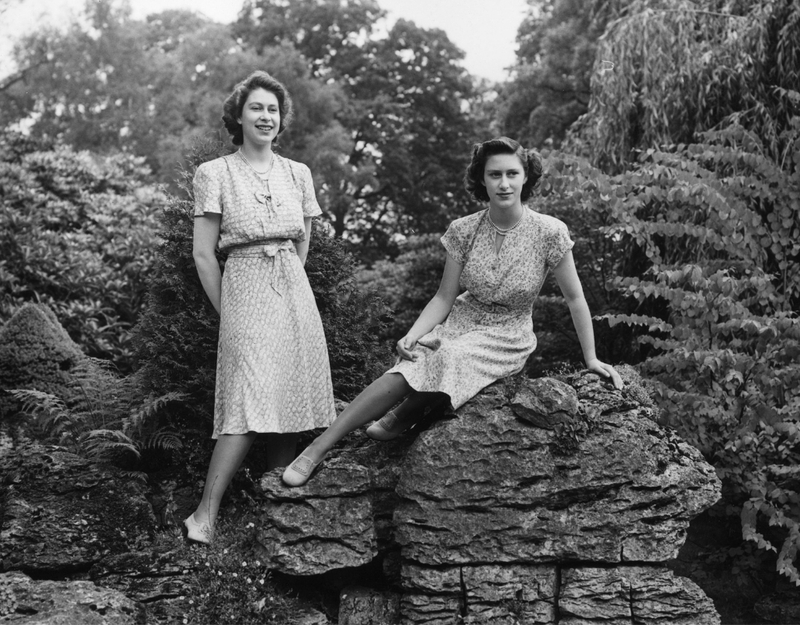 Before Elizabeth became the queen and fashion became secondary, both she and her sister Margaret were known in the British press for being young, good looking, and having impeccable style. Elizabeth’s choice to serve in the war effort popularized the look of royals wearing pants which was uncommon at the time. Both Elizabeth and Margaret were also constantly seen in public wearing new designers. Even Elizabeth’s famous matching hat and coat fashion today is a nod to her love of clothing design. She might be a pro now but in her early years ruling alongside her father, Elizabeth felt out of place at royal functions. 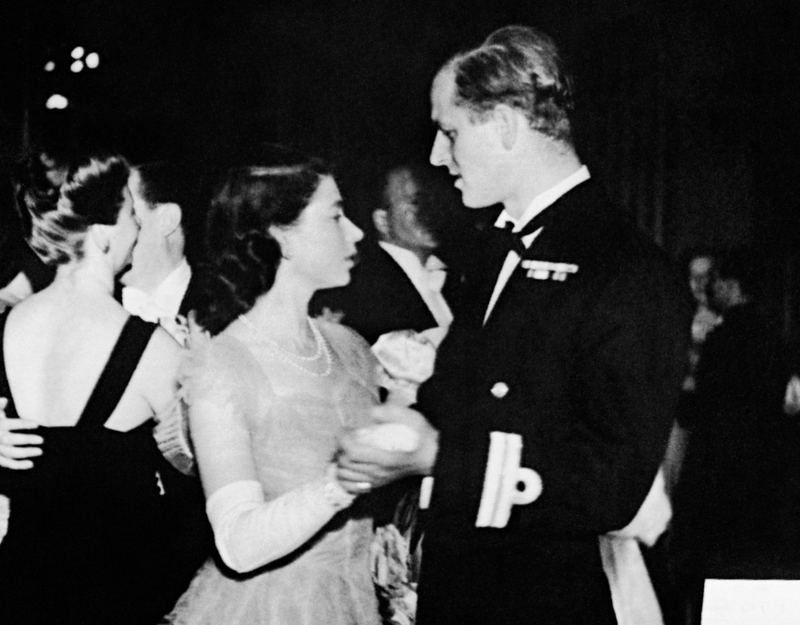 Even the look on her face here as she and Phillip dance at a royal event in 1948 shows her discomfort in the royal spotlight. One royal duty she is known for always having a hatred for is sitting for portraits. Over her lifetime as a princess and queen, Elizabeth has sat for 129 portraits but almost every artist who has painted her says she won’t sit still. 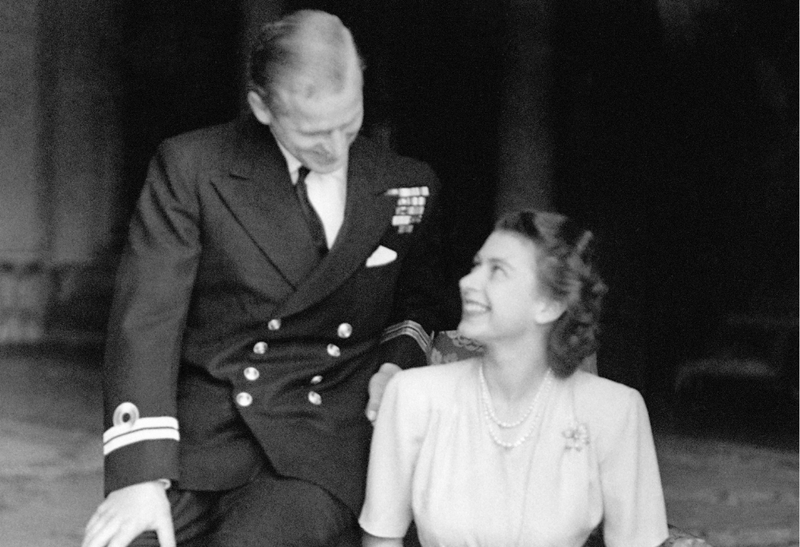 Elizabeth’s husband, Prince Philip, is related to her in two different ways. The couple is second cousins once removed through King Christian IX of Denmark. They are also third cousins as they share Queen Victoria and Prince Albert as great-great-grandparents. 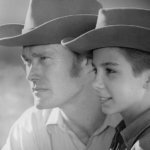 The familial connection wasn’t as scandalous at the time as you might think. By the 1900s, nearly every royal family in Europe was distantly related. 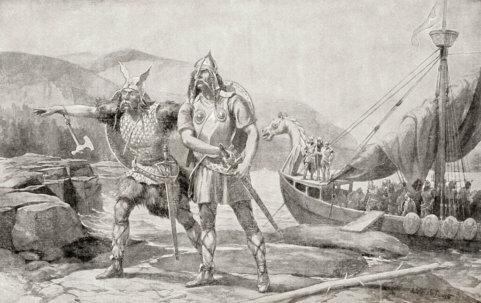 Marrying within the royal lineage was sometimes even a requirement. Not only is Elizabeth related to her husband but the two met when she was incredibly young. The couple first met when Elizabeth was eight and Philip was fourteen. They both attended the royal wedding of Princess Marina of Greece—who was Philip’s cousin—and Prince George of Kent—Elizabeth’s uncle. 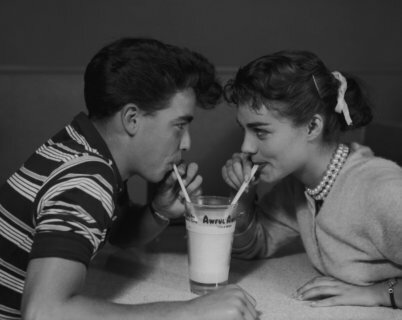 Elizabeth wasn’t smitten with Philip at the time but when the two met again five years later, she recalled being smitten by the now-18-year-old army cadet. When ascending the British throne, you have the opportunity to take a different name. 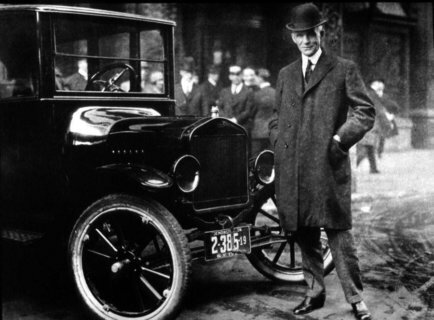 For example, Elizabeth’s father was really named Albert Frederick Arthur George, but he chose to take the name King George VI instead of King Albert. Elizabeth chose to keep her name when she became queen because of its royal significance. Her full name is Elizabeth Alexandra Mary. She was named after her mother Elizabeth, her great-grandmother Queen Alexandra, and her grandmother Queen Mary. Despite being one of the most heavily guarded places in Britain, in 1982 an intruder managed to break into Buckingham Palace and sneak into Elizabeth’s bedroom. The man, Michael Fagen, climbed over the barbed wire fence, climbed up a drain pipe, and through the window. A longstanding rumor said that Elizabeth and Fagen had a long conversation but in reality, she just ran out of the room and alerted the security team. In a tradition that dates all the way back to the 1400s, Elizabeth has special coins known as “maundy money.” The silver coins have her likeness on the front and she is supposed to give them away to the poor and elderly in a ceremony called Maundy Thursday. The official tradition also states she’s supposed to wash the feet of penniless subjects but that was cut out in the 18th century after it wasn’t deemed appropriate for a royal. Elizabeth’s children might be all grown up now but when she first had the, she set a new precedent for being a working mother. Elizabeth’s two eldest children, Prince Charles and Princess Anne, were born before she became queen. 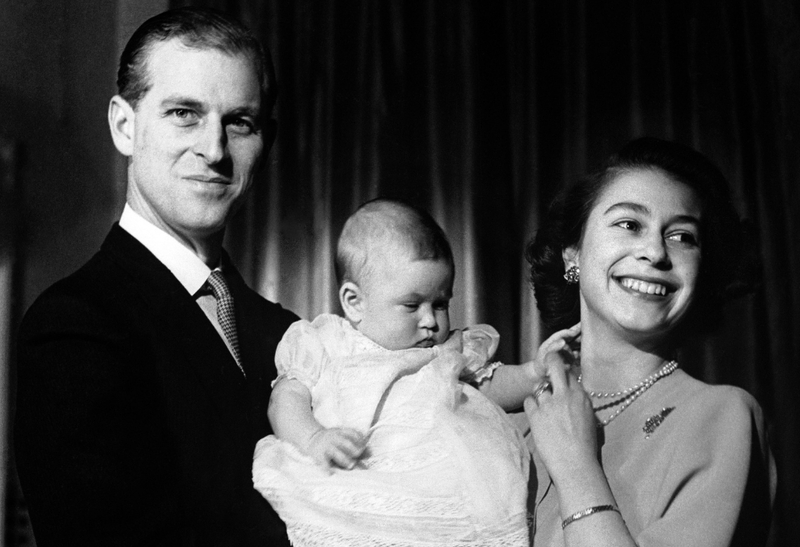 In 1960, with the birth of Prince Andrew, she became the first sovereign to be in power while having a child since 1857. Elizabeth used her platform as a queen and mother to help usher in the second wave of feminism as women became more and more independent. After becoming queen, Elizabeth ushered in a new era of the British royalty where she became more personal and accessible to the public. One of her favorite things to do was personally answer letters and other correspondence that people send. 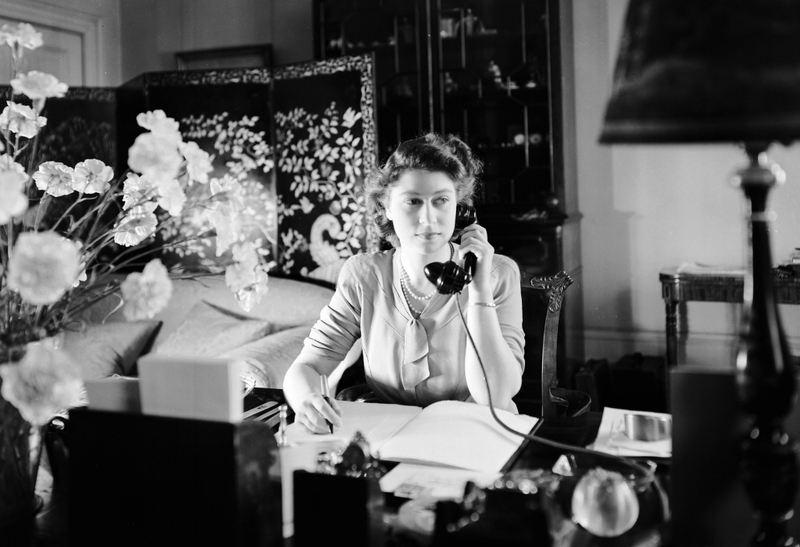 Throughout her reign, she has answered more than three million items of correspondence. She’s also known for sending out Christmas cards during the holiday season, and telegrams to couples who celebrate their diamond wedding anniversary. 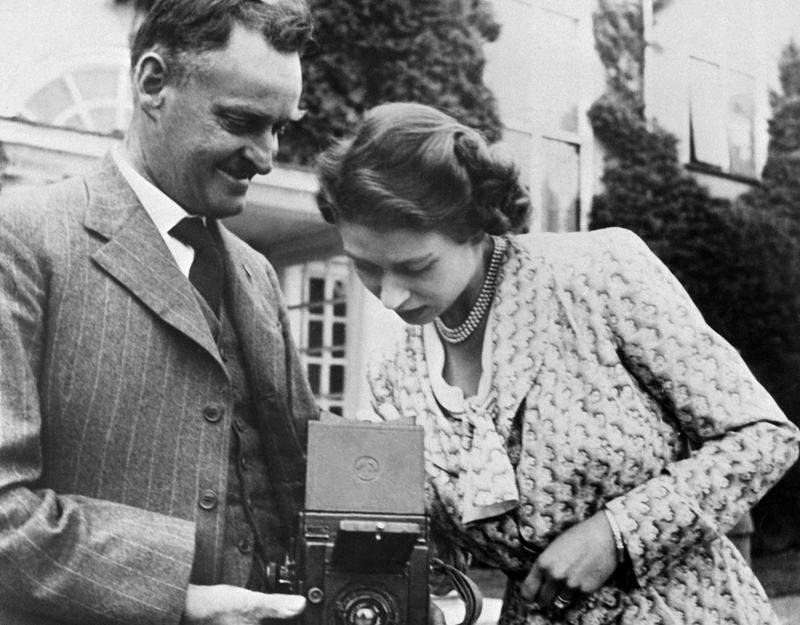 Even though she was the heir apparent for more than a decade beforehand, Elizabeth didn’t actually travel out of the United Kingdom until 1947. 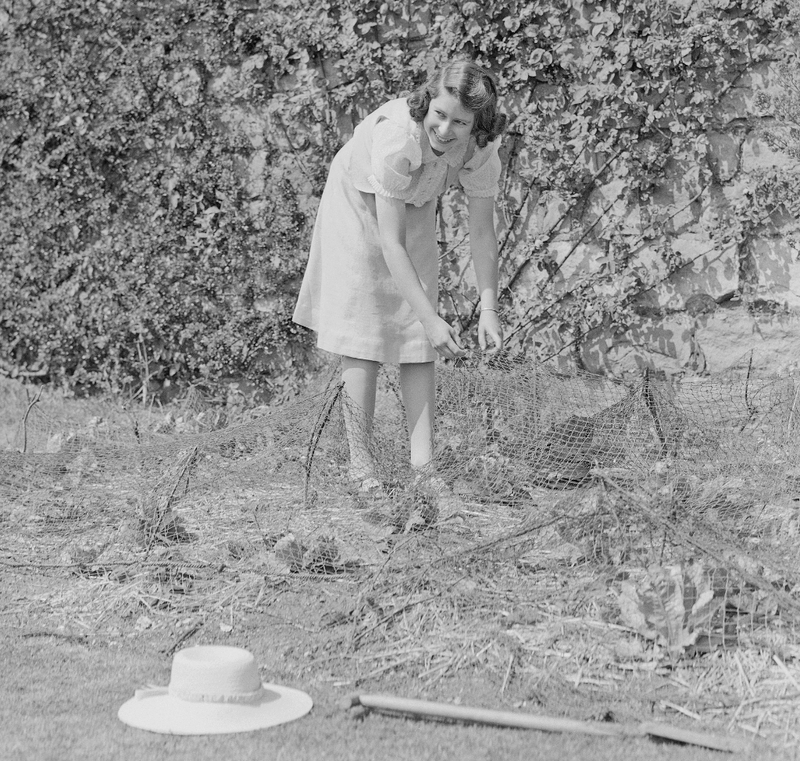 Her first trip outside of Britain was to South Africa with her parents and sister Margaret. It was in South Africa that she celebrated her 21st birthday and began to take on royal duties. 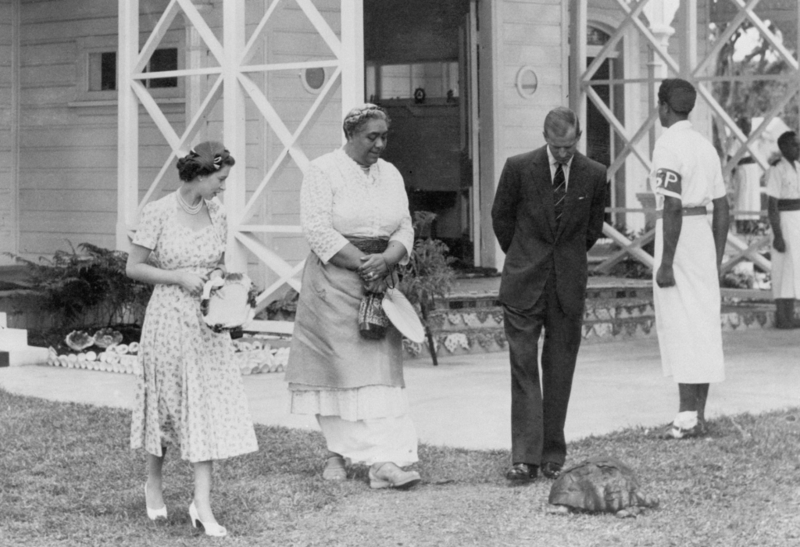 It was there that Elizabeth pledged her whole life “whether it shall be long or short” to the service of the entire Commonwealth. Since she was young, Elizabeth’s fame and status has left her prone to receiving some pretty unique gifts. Notably, she’s received two tortoises from the Seychelles in 1972. Elizabeth has also been gifted a bull elephant named Jumbo from the president of Cameroon, and a pair of black beavers from Canada. All the animals she receives get placed in the London Zoo. Other strange gifts for Elizabeth include a pair of cowboy boots from Texas, a case of pineapples, and 7kg of prawns. Elizabeth has always seems to be in a pretty good mood but she has openly admitted that the most difficult year of her life was 1992. 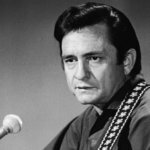 It was the year that not one, not two, but three of her children had their marriages publicly break down. Of course, the most notable one was the separation of Prince Charles and Princess Diana.